There are lots of reasons to take up hunting, fishing and foraging, but for me, the ultimate goal is culinary. Nothing is more organic, wholesome, local, and arguably more healthy than a foraged meal. Its certainly hard to appreciate a meal more than the one you have created with ingredients you have personally harvested. For those of you who have read my recent posts you know I recently harvested my very First Deer. This was an exciting experience and I was eager to conduct my culinary experiments with the results. Last Sunday offered some free time, so I was able to putter around in the kitchen to create my very first self harvested venison dish. 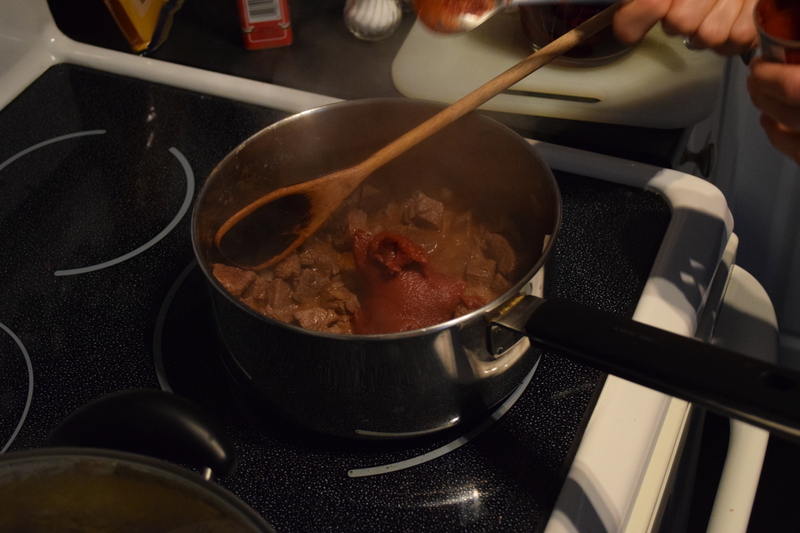 I chose to prepare the venison in a traditional Goulasch using a recipe that was passed down in my wife’s family from her Oma to her mother, and from her mother to her. Goulasch was a traditional way to prepare game meats for many eastern European countries and for good reason; Since this recipe is so flavourfull it makes it the perfect way to support the complex taste of wild game. As many of you who have family recipes know, quantities are sometimes subject to interpretation and written directions are more of a frame work than a recipe. The recipe begins with lightly frying the onions and garlic in oil or butter and then adding and browning the venison. 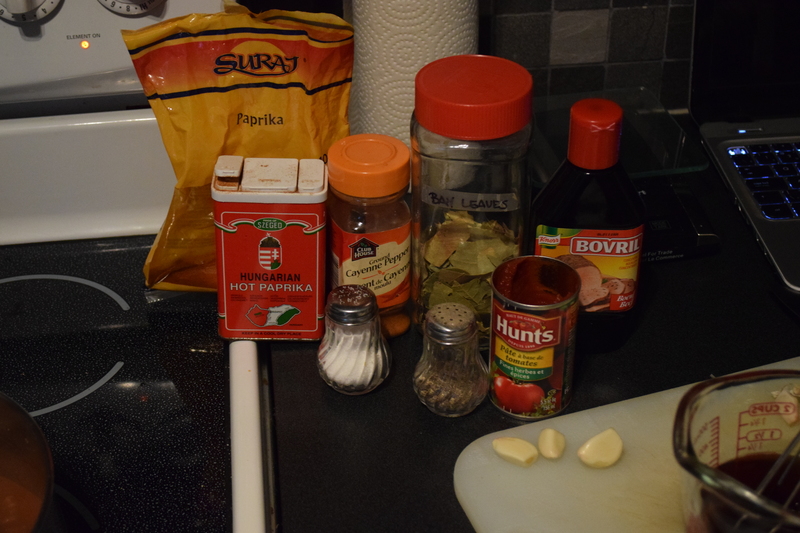 Following that add half a can of tomato paste, 2 to 3 table spoons of sweet paprika, 1 teaspoon of hot Hungarian paprika (optional) 3 to 4 bay leaves, 1 to 2 teaspoons of caraway, a pinch of cayenne pepper and a pinch each of salt and pepper. Add 1 to 2 cups of beef stock and water. I usually use 1 table spoon of concentrated beef stock mixed into 2 cups of water. Stir the ingredients and let simmer. Don’t worry too much about not having the exact amount of spice. Goulasch is forgiving and you can always add more later as it cooks. Once the spicing is right, Its just a matter of cooking until the meat is tender. Sometimes this takes 45 minutes, sometimes over an hour. Really it all depends on your cut of meat. But what do you eat it with you ask? Well goulasch can be served with anything from rice to egg noodles. However, in my family, tradition requires that European Goulasch be served with some form of potato accompaniment. And if you ask my father, the only side dish you should serve Is german potato dumplings (called Knödel). These beauties are simple creatures consisting of 2/3rds cooked and mashed potatoes, 1 3rd part flour, 1 egg and salt to taste. Basically you take all of these ingredients, mix them together and knead until you create a doughy mass. You can add more flour while you knead to get a stiffer consistency but I prefer them a littler looser. the looser they are the less “heavy” the meal will be. 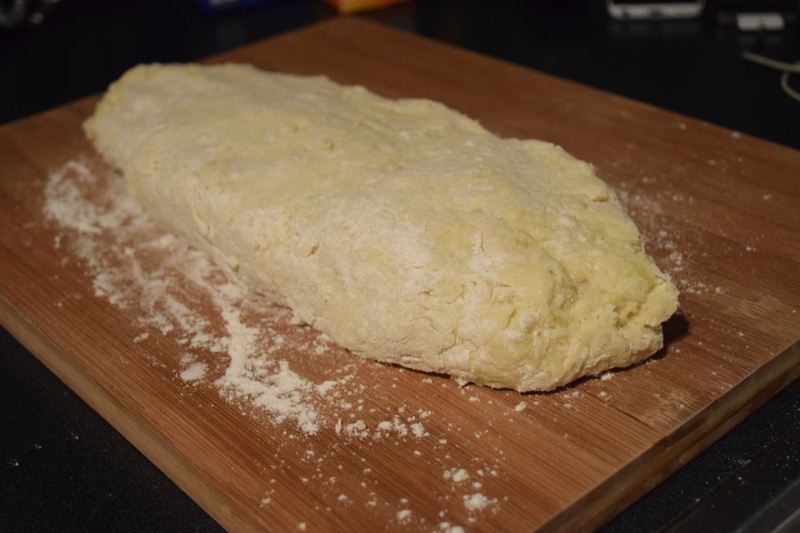 Once mixed, create a log of dough about 1″ thick (shown above) slice into bars or shape into balls and drop into boiling water. I usually wait about 5 minutes after these have floated to the top of the boiling water before removing. Afterwards, remove from the water, smother in Goulasch goodness, and enjoy the contrast of the simply flavoured dumpling with the spicy complexity of the Goulasch. 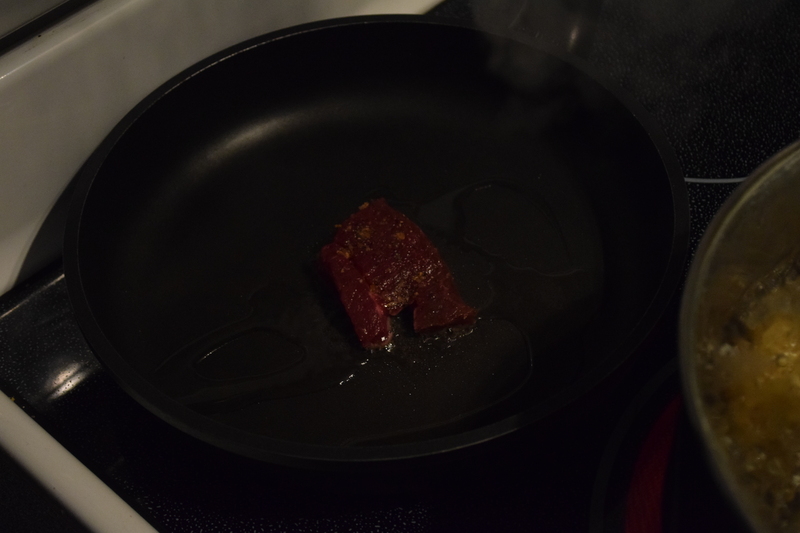 Seeing as how this was my first deer, I couldn’t resist the urge to quickly season and pan fry up a small chunk while preparing the main dish. Venison flavour can vary quite a bit depending on how it was harvested, the gender, its age, and what it ate throughout its life. Since its so variable I feel tasting the meat cooked in its simplest form is a vital step to assessing the inherent taste of your meat and properly selecting recipes for it accordingly. Tasting can prevent you from serving gamey atrocities to you family or guests, and from possibly turning people away from venison for good. Many people already have misconceptions that deer tastes bad or gamey. Likely caused by eating poorly prepared meat or even meat that wasn’t properly harvested. I feel its our job as hunters and cooks to make sure the meat is harvested and prepared appropriately; Hopefully converting others into venison lovers along the way. 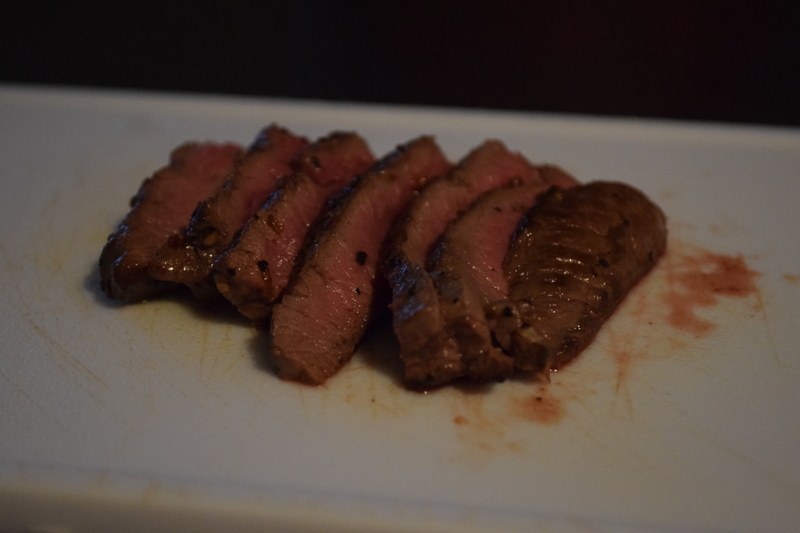 Above all else, avoid well done venison as it will become tough when overcooked, not to mention loose its true taste. Besides, the goal is to cook it so you can actually taste the meat, not char it into oblivion. The result? A tender, delicious and succulent morsel of wild goodness. I can honestly say, this tasted better than 95% of beef cuts I have tasted. Over all, the experience was a success. and I mean a success right from the hunting, to the cooking, all the way to the eating. This was the kind of successful experience I hope everyone gets to experience at least once in their lives. 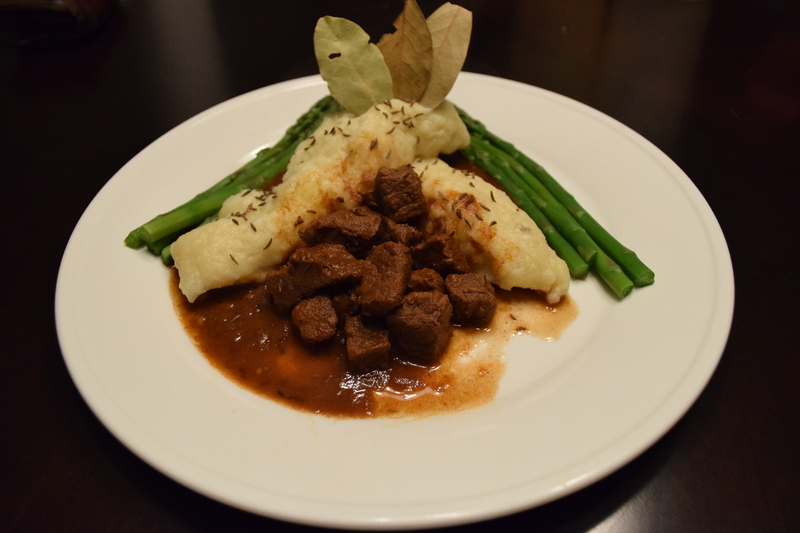 This entry was posted in Cooking, Foraging, Hunting and tagged cooking deer, cooking ontario deer, cooking venison, cooking with deer meat, deer goulash, deer recipes, fancy deer recipes, Get Outside, the wilds of ontario, venison recipes, wild game recipes, wild ontario. Bookmark the permalink.